The best chance for survival following a traumatic injury occurs when the injured person is seen and treated within an hour of the event. In the moments directly following a crash, seconds count. Participants are providing important medical information that could help emergency responders make split second decisions. That’s what the Yellow Dot program is all about. This is how the program works…. 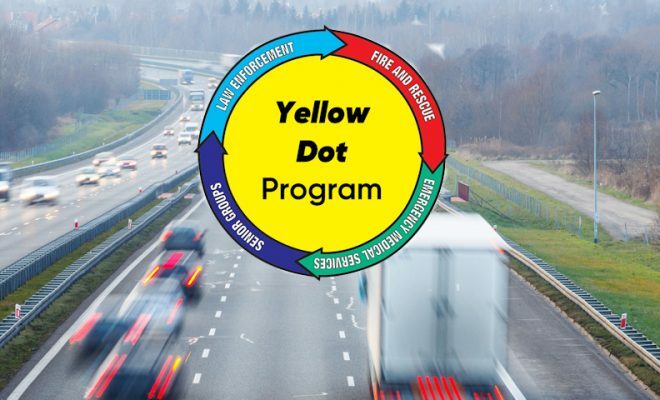 Pick up a Yellow Dot program folder at a public safety agency or display. Fill out the Yellow Dot folder with your contact and emergency information. Place the Yellow Dot decal in the lower-left corner on the driver-side rear window. Make sure the glass surface is clean so the decal will adhere. Put your Yellow Dot personal information folder into the glove compartment of the vehicle. The completed form should include a clear, close-up face shot picture that can be easily identified as a possible driver or passenger of the vehicle. Make sure the Yellow Dot folder is on top of other papers, and readily visible to first responders. Note: If there is more than one person who uses the vehicle, or if you routinely carry children in the vehicle, consider including a separate Yellow Dot folder for each regular occupant. Keep all Yellow Dot folders together in the glove compartment to make retrieval in an emergency faster. The form itself includes basic medical and emergency contact information, personal physician’s contact information, current medical conditions, allergies and medications, and a history of recent surgeries. To help protect your identity, don’t include information like credit card or social security numbers. The program is a free service provided to all Kentucky citizens, provided through the Kentucky Office of Highway Safety.